Ice Caves : Key To Preserving Biodiversity | Scientists & Co. The diversity of the world's flora, is facing a major decline. In particular, the crops we grow to provide our major source of our food. 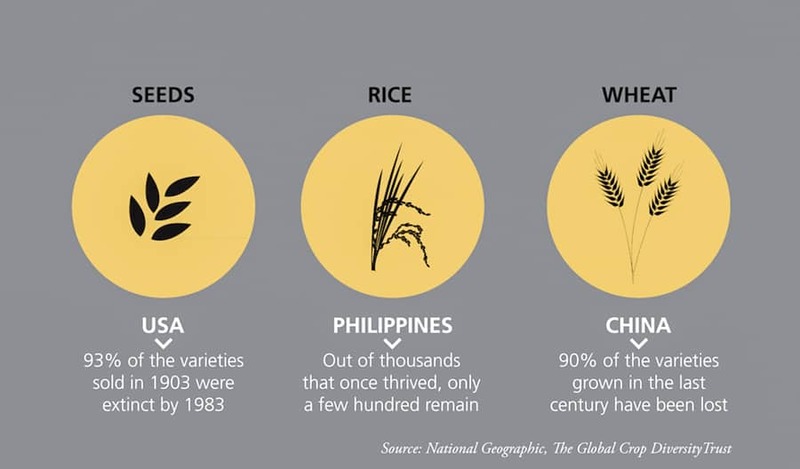 According to a report by the FAO (1) , since 1900, a significant proportion of plant genetic diversity has been lost and “75% of the world’s food is generated from only 12 plants" the most common being rice, wheat & maize (2). These are shocking statistics but what are the reasons behind them? Crops form a major part of our food supply: all fruits and vegetables come from crops, cows graze on grass, corn is a major component of chicken feed and even sugar is derived from the sugar beet or sugar cane, all of which were at some point planted as tiny seeds into the earth. Over the past century, as mass production forced farmers to change to crop varieties with higher yields, many of the crop varieties became extinct, significantly reducing the plant biodiversity. The data is shown in the figure below. Furthermore, natural disasters also threaten our agricultural biodiversity. Floods, droughts and wars can lead to destruction of large areas, potentially resulting in huge losses of livestock and damage to fertile land. Therefore, we must be sure that we will never run out of our most important food sources. Luckily, there are wise minds out there who have tried (in part) to solve the problem. Scientists, ecologists, botanists and engineers have come together to set up the largest seed bank in the world! Deep in the depths of the Arctic, over 500 miles from the northernmost part of Norway, on the archipelago of Svalbard to be precise, there is an underground chamber of size 1000 m2. This vault was constructed in 2008 to keep samples of all the world’s crops, so if ever there was to be a global disaster wiping out part of the world’s flora, all would not be lost. It’s a type of biorepository or biological storage facility, it now holds over 900,000 seeds from all over the world! Also known as the “doomsday vault”, it cost a whopping US$9 million to construct and running costs add up to around $100,000 per year. The temperature inside the vault is kept at a chilly -18°C to avoid long term damage to the seeds as they are kept in airtight containers to prevent them absorbing moisture from the air and growing mouldy. Interestingly, the strategic location ensures that even if the internal cooling fails, the surrounding temperature will not rise much more than about -8°C! 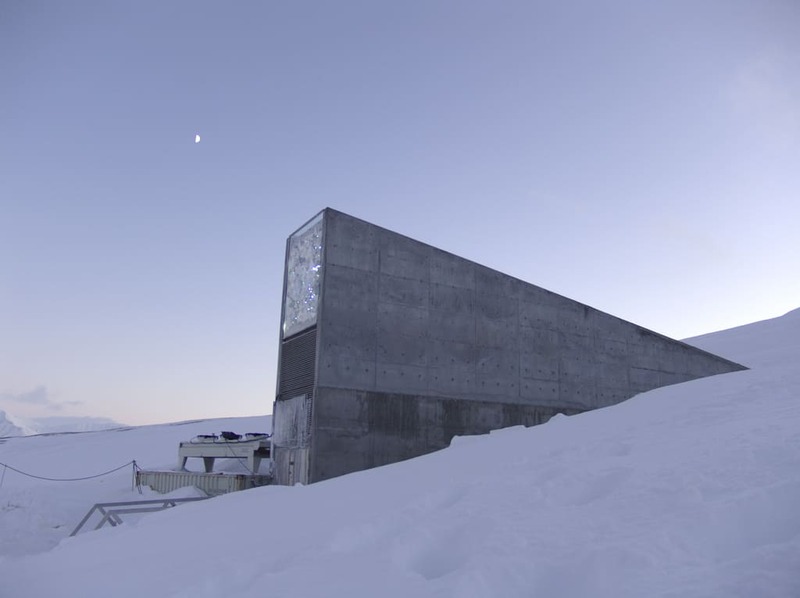 Furthermore, the seed vault is built into a mountain so if sea levels were to rise, the seeds would still be safe. With all these security measures in place, we can rest assured that the contents of the vault will be safe from a natural disaster. On the other hand, it is only the depositors that have access to the seeds they deposited, as they “are not distributed to or given access to anyone other than the depositor”, meaning that political generosity would have to come into play if one country was suffering a crisis and in need of particular samples. It is not the only seedbank in the world, in fact, there are a number of others such as Navadanya in Uttarakhand, India, The National Center for Genetic Resources, Colorado, US and the Millennium seed bank in Sussex, UK but the Svalbard seed vault is still the largest, acting as a backup of all the others. (2) Biodiversity International (2018). [online] Available at: https://www.bioversityinternational.org [Accessed 2 Apr. 2018].